Description: It's another (sped-up) retro video game...Gizmos & Gadgets!, a game that I first played in elementary school. Tomorrow I'll be summarizing the long-anticipated Moto X event over at http://dougaschublogs.blogspot.com. See you there! I'll be sharing my thoughts at http://dougaschublogs.blogspot.comsoon. See you there! As the calendar has now made it into the second half of summer, my activities are starting to pick up again. Most notably, Driver's Ed started Monday, and I've been having soccer practice twice a week for a couple of weeks. And, oh yeah, 4-H projects for the county fair next week. The deadline is kind of catching up to me to complete the 20 projects I signed up for. So instead of me typing out a whole new post, I'll just share one of my completed projects. This project outlines my recreation of the village of Stetsonville, located in Wisconsin, in the new version of SimCity. It is designed to inform the general public about using simulation games to represent real life. Thanks for reading today and I'll be posting a gaming video tomorrow on YouTube. See you there! While this is certainly not the first publication to go all digital, it is the first one that I've been subscribed to that is doing it. This is how my initial experience was. So I went on and activated my Digital Pass, and attempted to get my subscription for my computer though Zinio. I typed in my email to activate my subscription...and received an error. I wasn't too surprised by this just because I figured that tons of people were doing the same thing I was. The page prompted me to call PCWorld support-but the LINE WAS BUSY! I have never heard of a support line being busy and not being able to connect at all. So as I type this...I haven't seen the digital PCWorld yet. And I really want to. Description: I play SimEarth today (at 2x the normal speed, of course) and I start to terraform Mars...if the planet doesn't freeze over first! Be sure to check out Monday's vlog about my trip and yesterday's Live Tile post over at http://dougaschublogs.blogspot.com. I'll see you back over there tomorrow for a new post! When Windows Phone 7 was released late in the fall of 2010, it showed a new direction of Microsoft's core design strategy. A major part of this was live tiles. 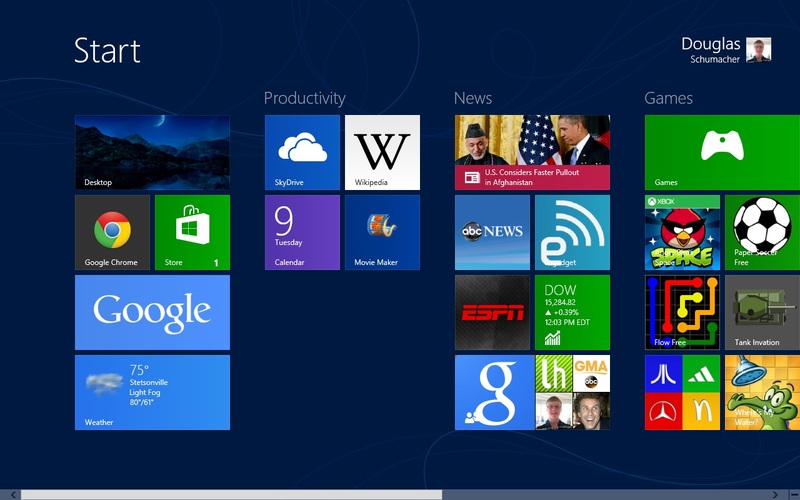 They now appear in Windows 8, WP8, and Xbox Start Screens. Back at its announcement, dynamically updating boxes on a screen showing you the latest data available to the app seemed like a whole new idea...but was it? Many might point to Android's widget ability, included by Google since version 1.0, two years prior in 2008. Even though I don't see this a direct descendant to the Live Tiles, there is a software platform that included updating tiles on a homescreen since 2006. There is a good chance you even own one of these devices: The Nintendo Wii. Today's Vlog-Thoughts From Places-California (FBLA NLC 2013): Day "20"
I am aware that not all my pictures matched up when I was talking about them...and there are not very many videos because I wanted my memory to the video of the trip. I hope you enjoyed this! If you have any questions, please ask! I'll see you tomorrow at Douglas Blogs (http://dougaschublogs.blogspot.com) with a new blog post! Inspired by Hank Green's CLOP 2X Video! Just a quick reminder that I'm hanging out on Google+ at 11am CST this morning. Come to discuss random stuff and have some fun. You can circle me here...and talk to you then. If not...I'm off, but scheduled posts are still coming everyday following Operation Storm as I'm gone. As I was browsing though the FBLA NLC master schedule yesterday, finalizing my plans, I noticed that all the testing events had the word "ONLINE" printed next to them, including mine- Introduction to Business. I could only assume this means that I will be traveling all the way to California, essentially, to take a multiple choice test on a computer sitting somewhere in the Anaheim Convention Center. Huh? It is certainly not my favorite activity to travel. For me, it is the actual transportation part that bothers me. For every voyage I've taken, you have to sit there and basically do nothing either on the ground or up in the air six miles and try to relax for one, two, five hours at a time. You can try to be distracted by technology, or a book, or the world around you-but nothing can take your mind off the topic of "Why am I doing this?" Today's SimCity video is also up on my YouTube channel. I'm livestreaming SimCity today starting around 11:15am CST in the box above. Tweet me with questions and comments, since I cannot see the Twitch chat. See you then! Wednesday's livestream ended up failing because of technical difficulties. Thank you to those who did show up...and a special livestream will occur this weekend. See you then. If you watched yesterday's vlog, you would know that I headed to the dentist today. No cavities, everything was fine. The problem, though, occurred as I was sitting in the waiting area before leaving. If you've ever been at a dentist (which I hope you have-eww), you would notice that there is always a radio playing over speakers in the background-quiet enough so that it doesn't bother anyone but loud enough to keep the patients' auditory systems occupied. This is key to what happened to me today. I happened to be in between Can Knockdown 3 levels when I heard six lyrics that anyone on the Internet knows well. I'll just say that they rhymed with "Ever showing moo comparative true sup..."
If you can't figure it out, here's a hint. Post your guesses in the comments below. Description: I discuss softball and why it is not my sport. That is all. Description: Today's vlog covers a new forecasting service, gives an outlook for next week's weather, and reviews week two of Operation Storm. Join me back here on Monday for a new video. Thanks for watching! Apple is steering away from a cat name for OS X (10.9) Mavericks. The update, mostly likely to be $20, includes synced notifications, App Nap along with other performance and power saving features, along with new desktop apps of Maps, iBooks, and iWork with iCloud (also available on PC). Better multiple display options and file tagging is also new. It is releasing this fall. Personally, I've never used OS X beyond what is required at school, so I cannot form any major opions on Mavericks. I will say, however, that this appears to be a minor upgrade (vs iOS 7-see below). Description: Today is Day 4 of Operation Storm, a Monday as well, so here is a vlog in which I try some different foods and discuss what might happen at Apple's WWDC at 12pm today. (Filmed in the morning, plus 4 hour upload). There is a bonus video coming this evening detailing what did happen at WWDC, along with a blog post tomorrow over at http://dougaschublogs.blogspot.com. See you there! Today, June 7th, at 12pm CST, I will be covering the Google Chrome Mobile event LIVE in the Chatroll box below. Join me for the latest. *UPDATE* The liveblog box has been removed. The event happened to be about Chrome Roll-It, so nothing too exciting happened. Watch on Monday for a recap on Apple's WWDC. What is there to say? I am back to the (public) internet with tons of new content this summer. With your help, I'm going to hit the Internet like a storm. Prepare to see my thoughts in a video form, uploaded to YouTube. Come see my expanded talk, in text form, on this blog. On the first and third Wednesdays of the month, be part of a Google Plus Hangout Party. The opposite Wednesdays, I'll be playing SimCity live on Twitch while answering Twitter questions. Times are TBD. In addition, I'll be liveblogging/livestreaming major tech announcements and Wisconsin severe weather events all summer long! I am also taking a trip to California at the end of June, so be ready to hear about that. Since 2010, US cell carriers have been working on building next-gen, faster data networks. In the start, Sprint bet on WiMax technology, while Verizon went for LTE. AT&T and T-Mobile worked on HSPA+ (which is technically super-fast 3G). Fast forward to 2012, and the "Big Three" have 4G LTE networks, and even regional carriers are getting into the fast lane. For a large portion of Americans, these networks are at their disposal...but rural customers are still in a waiting game. 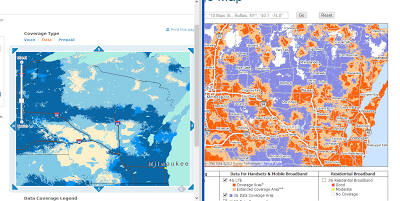 I've mentioned before that I live in North-Central Wisconsin and I happen to live within "cell coverage distance" of Highway 29, a main highway connecting Green Bay, Wausau, Eau Claire, and eventually the Twin Cities. This is a main corridor, and so cell coverage is easy to come by nearby. By that I mean that Verizon, AT&T, and Sprint have networks along it...T-Mobile has no network at all built beyond western WI.